The annual spectacle of thousands of Olive Ridley turtles nesting at Odisha’s Rushikulya rookery in Ganjam district is so far missing this year. This delay of almost a month has given way to speculations. Experts believe climate change, illegal fishing and illumination of Gopalpur port and other establishments can be blamed for this. The state’s Gahirmatha Marine Sanctuary has already seen 4.6 lakh turtles lay eggs between February 28 and March 8. “Last year, around 4.75 lakh Olive Ridley turtles nested on the beach of Rushikulya. It is too early to conclude that turtles will skip the beach this year. Large numbers of turtles are congregated in the sea near Rushukulya so we are hopeful that they will come to Rushikulya soon to lay eggs,” said Ashish Kumar Behera, divisional forest officer, Ganjam. If they do skip the beach, this won’t be the first time. In 2002, 2007 and 2016, the turtles had not shown up at Rushikulya and that’s why forest officials say they can’t predict nesting patterns. Researchers fear that the turtles might not turn up owing to climate change. The sandy beach, once considered the favourite site and congenial place for mass nesting, has undergone rapid topographical changes. Conservationists say nesting sites have been damaged by sea erosion. “Constant erosion of the nesting site, illegal fishing, illumination of Gopalpur port and other plants and factories nearby are the main factors for this delay,” said Hemant Rout, an environmentalist and the secretary, Gahiramatha Marine Turtles and Mangrove Conservation Society. He added that turtles often die at the beach after getting entangled in fishing nets when fishing trawlers are supposed to operate five kilometres away from the beach under the Odisha Marine Fishing Regulation Act, 1982. The state Fisheries & Animal Resources Development Department registered 22,037 fishing vessels violating the law including 1,754 trawlers. 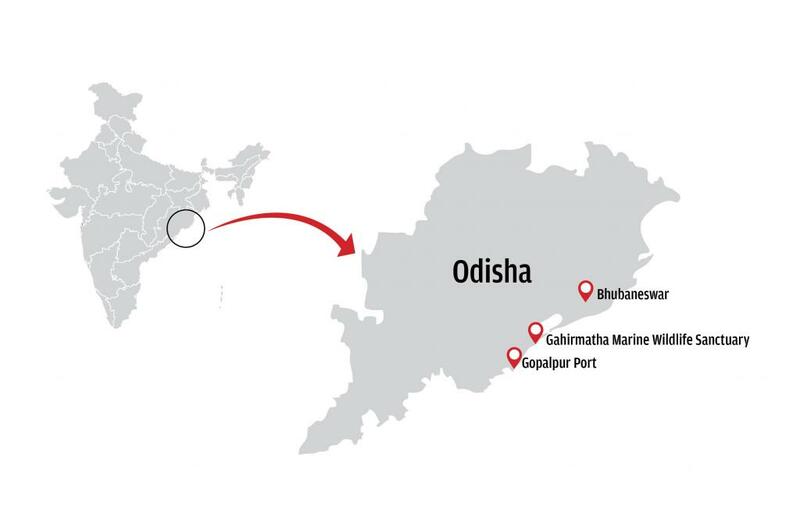 In response to this article, the Gopalpur Ports Ltd issued a release saying the distance between Gopalpur port and the nesting site is 17 kilometres. “Gopalpur port has cut off lighting, which ensures no sky ward spillage of light. Horizontally mounted lights with zero swivel for all outdoor lighting, in line with IUCN guidelines, is followed,” read the release. “Gopalpur port has been working actively with the forest department for turtle conservation for many years now. Every year a trawler with provision for fuel is provided to the department for patrolling against trawl fishing and gill netters,” it added. Experts suggest that trawlers be equipped with turtle excluder device (TED), a small additional net or metal grid inside the net that allows entangled turtles to escape. A TED is also an escape hatch in the net that lets small beings like shrimp enter the net and blocks large ones like sea turtles and directs them, with a sloping angle, to an exit hole. The device can ensure that 97 per cent fewer turtles are caught in fishing nets, while reducing number of prawns caught by just two per cent, added Rout. After Central Empowering Committee (CEE) 2004 order, the fisheries department had provided 1,800 TEDs to fishing trawlers around 12 years ago. But Rout alleged that no fisherman is using it. The environmentalist added that the fisheries department should not renew licenses of trawlers without TEDs, But they are not taking any action against them.